From the very moment that 2017 started, late in the day on November 8th 2016, I knew that it was going to be a year of trial, adversity, and a whole lot of difficulty. Sadly, I was absolutely right. This has probably been one of the most stressful years of my life. While I expect future years will also be stressful, I highly doubt any will be so full of all the garbage that life slung in 2017. Rather than wading through the discarded mass of things I’d like to forget, my retrospective of 2017 will instead have me looking up. I will not cast my gaze upon anything bad. I will only consider the birds of experience that have taken flight. In this way, I hope that it will put me in a better place for the advent of 2018. Without further ado, I give you the Top Five moments of 2017 in no particular order. Sometimes, it’s enough to acknowledge how awesome things are without the need to rank them. One of the biggest problems that I struggle with is antisocial behavior. I’m an introvert – a fact that nearly always makes my students gape in surprise. See, to them, “introverted” means shy, unable to interact with other people, possibly even mildly autistic, but to them, I’m the guy who gives ridiculous examples that push the envelope of what they thought a classroom could be. But that’s not the core of introversion , the core is that introverted people just prefer spending time alone. That is me to a “T.” Because of this, I sometimes do come across as socially awkward, more of a spectator than an interactor. Interacting with people – even people I love – can be challenging. I work best as a part of a group, where I can pass the responsibility of carrying the conversation to those far better suited to it than I am. With the passing of my uncle Richard Thomas Marr – better known to friends and family as Lefty, I was given a wonderful opportunity to enjoy the company of my family. I love these people. The Marrs, the Gilsons, the Lescinsky’s, the Worthingtons, the Johansens, the Queens, and all the extensions of this. I love these people beyond words. I love every single moment I spend with them, even those moments where we have no words, just tears. If I have any great regrets in life, it is that I haven’t spent enough time with them. Even my whole life with them wouldn’t be enough, but the fact that I have spent so much time apart from them all just makes me wish – all the more – that I could spend time with them. So why haven’t I? See the above paragraph. Getting together to say goodbye to Uncle Lefty was one of the most bittersweet things I have ever had to do. When I am not writing, I am teaching; indeed, the two are not mutually exclusive, as writing is just telepathic teaching. Throughout his entire life, Lefty was a teacher in the best possible sense. He taught English. He taught debate. He taught hockey and baseball – and possibly even at the same time. He taught life lessons. He taught perseverance. He taught simply because learning is fun. He taught me how to have an open mind, to consider other points of view, and he helped fuel a love of the variety and wonderful madness in life. I am a far better teacher having had him as one of the three most influential men in my life. Last November, he passed away. I got the call in the middle of one of my classes, and it wrecked me. Death is inevitable, but never expected. On Earth Day, April 22nd, we got together at Milton Academy, a place where he spent many years, teaching, coaching, and raising his four young kids. Those four kids are all grown up, and I couldn’t be prouder to count each of them, their spouses and children, family. They are vibrant, exciting, brilliant, and wonderful. The ceremony brought in friends and family from near and far, all of whom had wonderfully anecdotal things to say about him. Lefty was nothing if not anecdotal. Indeed, his nickname, Lefty, is a very example of that. Saying goodbye to him was hard, but through the whole weekend, I felt nothing but joy. Standing beside me were my own parents. I got to share a reception plate with one of my brothers in Straus Hall, where we discussed near and far as we looked down on the milling crowd of people. I got to enjoy a drive with a beautifully vivacious cousin who has joined a long line of family at Williams College. Standing at the Marr gravestone, I listened to the eulogy given by one cousin as I stood between another and my mother. After years of life getting in the way, I finally got to meet three of the wonderful sons of another cousin. The whole funerary weekend was buoyed by love, respect, gratitude, and comfort. I miss the man terribly, but thanks to who he was, I was surrounded by only the best of this world, and as a result, I enjoyed this experience tremendously. The Slideshow of Lefty’s life and the amazing people I am blessed to call family. For the past three years, my wife and I have been living in Washington State. While more cynical individuals might associate a specific green plant with this state, I can’t think of Washington without imagining a tower of white rising from its horizon. The Twelve has been to MT. Rainier. It wants to visit your home, too. Get your copy today! Mount Rainier might not be the tallest mountain in the USA, nor even in the continental USA, but it is a massive tower of rock, snow, and trees that fills the eastern horizon of Olympia, or at least, it does when the rains and cloud cover allow it to. Since arriving here, my wife and I have wanted to ascend its sides. This year, we did so twice. While we have taken somewhat easier routes, both times starting at Narada Falls, I doubt our adventures there are through. Why did 2017 have to be about so much death? After all the deaths in 2016, wasn’t the Grim Reaper satisfied with his collection of talent? Apparently not. Tom Petty. Fats Domino. Adam West. Butch Trucks. Gregg Allman. John Hurt. Chris Cornell. Chester Bennington. While I am saddened by all of these losses, it is the latter two that most resound with me. Not just because of who they were in life, but also their means of death at their own hands. Both Cornell and Bennington were lifelong sufferers of Depression, an insidious disease that haunts its victims in the darkest corners of their reality. Just when it might seem that one has the illness licked, it returns in force, beating people down and driving them into the dirt of their own failures. So why am I highlighting such a tragedy in this list? Was this not supposed to be about the good things to come from 2017? So why am I talking about another death? From the very moment I heard the first notes of Linkin Park’s song Crawling , way back in 2000, I was in love with this band. I thought “This is a band that knows their art.” They were raw, edgy, and did angst in a way that not even a Japanese Anime could possibly touch. What impressed me most about them was their composition, which was a mix of hip-hop, screaming, metal, but mixed with an auteur’s understanding of story, emotional resonance, and dynamics. This resulted in a band that pushed the envelope of music in a way that struck home in my heart. Though I couldn’t directly relate to the trials, tribulations, and roller-coaster of experience that Chester and Mike (Shinoda) sang about, I could – and did – recognize a whole new style of music that lit fires of excitement in me. Linkin Park transcended situations, and time and time again, with new release after new release, they reconnected with me. They reminded me again and again of why I fell in love in the first place. Quite possibly one of the biggest joys in my musical journey (right up there with that time that Phish brought Jay-Z out to give me a birthday serenade) was when Linkin Park decided to play my wedding. Both my wife and I love the band, and on the drives to the aforementioned mountain, we blasted Linkin Park through our car’s speakers. And then Chester died. The poor man dealt with a whole lot in life of a kind that nobody should ever have to. I can’t even begin to imagine what he had to put up with, or how the music that they produced would screw with his mind. Chester was a tormented soul struggling with a massive illness. The most amazing thing about him is that he continued to put out great music for more than seventeen years. With the angst that personified the band, it might be easy to assume that he would lose the battle after only a few years, but with his brothers in Linkin Park, they endured to produce seven albums, do countless concerts around the world, and reach out to hundreds of millions. For years, Chester endured, he persevered. Much as Chris Cornell also did. But like I said, Depression is insidious. It reaches out when you least expect it and then it poisons you with its venom. Following Chester’s death, his bandmates were understandably devastated. But within all the angst that the band has produced, there is a message of vitality. Linkin Park rose up and put together a final show, one in his honor. Following this concert, I did a piece that outlined my thoughts on it . It was a raw show, one lacking months and months of preparation, but in the tenderness of its unprepared quality, one could feel the emotion. Indeed, this emotion made it all the more poignant a concert. As any eulogy should, it celebrated the life of the one lost. One of the greatest things to come from Chester’s passing is the sense of perseverance. Though one more light has gone out in the sky, some of us care enough to rise above. This is his legacy. This is why I choose not to see Chester’s passing as a negative thing, but instead embrace it with positivity. I’d like to think that he would be proud of anyone who chooses to overcome when it would be so easy to give up. In 2017, I learned that truly evil people existed. Even worse, they were everywhere. Early in 2016, I was offered a job that was too good to be true. Everyone around me told me that it was, but I told them to just wait, that we just had to trust the system, even if that professed system seemed as dodgy as a dodgeball pro . I should be thankful that I’m surrounded by people too good at heart to tell me “I told you so,” when they have every right in the world to rub my nose in my mistake. For about a year and a half, I was patiently waiting on promise after promise, dutifully fulfilling all obligations that had me putting in 20 hours of work from Monday to Friday, and then filling the weekends with between 12 and 20 hours of more work. It was a tremendous amount of time, all dutifully recorded, and all of which amounted to virtually nothing. When summer rolled around, this job that seemed too good to be true was, in fact, revealed to be too good to be true. It turned out to be a very elaborate scam to get me working my tail off 7 days a week all to produce stories for the one who wanted my work for themselves. Money was promised. A major publishing company was cited as the backer. Promises, promises, all the while, the grand manipulator got their jollies behind my back. To what end? Who knows. It is said that the rational mind can only speculate as to the motivations behind a depraved mind, and to be honest, I’d rather not. I’ve given enough of my time to the degenerate slave-driver who had so wretchedly and shamefully ensnared me. When my liberation came, I managed to retain the work and rights to everything that I had touched in the year and a half of my enslavement. Special thanks to Cayenne Law for their help in getting it all sorted. Despite the heartbreak of this grand deception and fraud, and the loss of the countless hours I was owed for, I was able to step away from it with something, at least. Escape from the Spotlight is a strangely prophetic look at the whole situation. While several drafts of this were written during the period of manipulation, the story touches on the worst that humanity had to offer: people that would roll over anyone in their path, just for the sake of their own glory. The Spotlight in this novel is no mere concept, it is a character of the evilest sort, one whose personal satisfaction destroys everyone around them – much like the person that inspired this story. I will admit that this is not my finest work, owing primarily to the fact that it didn’t wholly come from me, but it is quite real. There is no Rob Queen in this story, nor is there the actual person-in-question, but it is a situational tale, one that delves into the speculative fiction of having one’s very identity stripped from them. Of all the work that I did over this year and a half, Escape from the Spotlight is about the only thing that I have been most readily able to adapt into something that I hope will make up for all this lost time. It was a mostly-finished piece that wouldn’t take much adjustment to move away from the company’s IP that I was supposedly working for. It would have been so easy to go the route of Chester Bennington and give up both on writing and on myself, but I chose not to give in to the evils of the world. Instead, I pushed ahead with this novel, until now, where I can proudly say that the book is published an available on Amazon.com. It is a story of scars, of joy corrupted, and of the anguish of a harsh lesson, but every moment in it is honest. Judge it as you will. Any review, good or bad, is appreciated. Finally, a video game. A distraction. A safe place of pure imagination, where I have been able to lose myself 5 minutes at a time. Like with Linkin Park, from the first moments of the first notes of Nobuo Uematso’s theme to the very first Nintendo Entertainment System version of Final Fantasy game, I’ve been hooked. I’ve played and beaten every game from Final Fantasy One through Ten, Twelve, Final Fantasy Tactics, Mystic Quest, and a few others. The ones up through Fifteen and a number of other versions of the game haven’t quite justified an investment in new waves of console games, but lack of play doesn’t necessarily mean a lack of knowledge. Suffice it to say that I have played a lot of Final Fantasy through the years. This game series is probably the single most inspirational game I have ever stumbled across, and for all of the right reasons. It is a mix of wonderful music and sweeping fantasy stories, filled with worlds populated with some of the richest characterization in any RPG. The magic, the fighting, the heartbreak, the villains, the art – all of it has helped to draw me away from any real world problems I might have. Plus: Moogles. 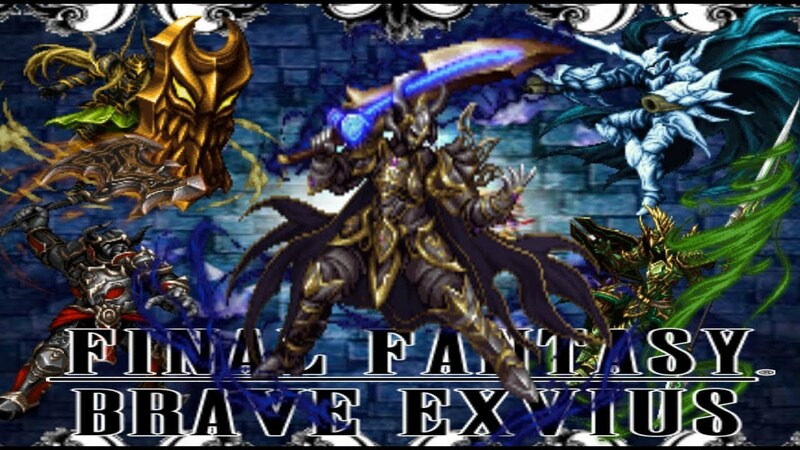 FFBE is a free-to-play mobile game that follows the story of Rain, his adopted brother Lasswell, two knights of the kingdom of Grandshelt, and an enigmatic healer named Fina. From the start of the game, they are out to stop the destruction of their home from a sextet of knights known as the Veritas. What makes this game so wonderful is that it draws on countless characters from previous Final Fantasy games: Warrior of Light, Cecil, Locke, Terra, Lightning, Ashe, T.G. Cid (Orlandu), Papalymo, Cloud, Cloud of Darkness, Kefka, and countless more, while also injecting a host of brand new, FFBE-specific characters. This is a fun game whose parent company, Gumi is wonderful with their communication with their fandom. In playing FFBE, I get a sense of community both from my interactions with other players and also from the company, itself. Indeed, when the company asked fans to create some characters for the game, I couldn’t help but flex my own creativity and submit not one, but 3. While I try to keep the more addictive qualities of gaming in check, I can’t help but feel that FFBE transcends mere mindless entertainment. It is a game I can enjoy with my wife (who sometimes has far better luck in-game than I do), and it is a game that I can discuss and share with others like me thanks to Facebook. Best of all is how it bridges my past to the moment, and in doing so, inspires me to be as creative as I am able to be. Let’s just hope I can continue with some excellent draws in the weeks and months to come, especially once Sephiroth comes out. One final piece of sweetness throughout 2017 were those people who I see every weekday at work. The day job shares some of the greatest co-workers in the world, and though we’re a small little division of the company, we’re top quality. We also draw in some of the best students a teacher could possibly hope for. They’re a goofy bunch, but lovely in spite of themselves. Thank you everyone who came along for the ride in 2017. Here’s to making 2018, bigger, better, and far less traumatic for all involved! Don’t forget to check out my latest novel: Escape from the Spotlight. Give it a read, give it a review, and let me know what you think. And thus is Life, isn’t it? It tests, rewards, teaches, softens and hardens. 2017 was all of that, and you are set up for 2018. How blessed you have been. Happy New Year! !